Another lamb led to slaughter lies in myriad pieces in my freezer. I have another 35 lbs or so of lamb to consume over the coming autumnal months. But slow-grilling season is quickly passing. There’s no way in hell that I will keep a grill going for 4 hours in my driveway while the temperature drops around me. The only solution that came to mind was a hibachi. To tell the truth, I can’t remember to which decade hibachis– those small cast-iron grills — belong. I’ve been racking my brain, but the only thing I can be sure of is that their popularity predated the 80s. I’d love some input here. Somewhere in my past, hibachis became the rage. When? Why have they gone out of favor? To inaugurate the hibachi, I decided to make a dinner of two lamb chops and roasted eggplant.I have installed my new hibachi on a pizza stone set upon a wooden tray table that I can position anywhere I please on my deck. I made a half-assed marinade of olive oil, a sprinkling of sherry vinegar, minced garlic, Malden salt, and ground pepper. I also put a big handful of wine oak-barrel wood chips in a bowl of water to soak. Wouldn’t the oak compliment the lamb? Fortunately, my charcoal chimney just fits within the hibachi. I used hardwood charcoal to begin a fire on the coal grate while I prepared the sliced eggplant indoors to roast in my oven. The main question for me was how much charcoal would I need. I filled the chimney 2/3’s of the way up with charcoal. When the coals were bright red and shooting up flames, I slipped on my garden gloves and gingerly poured the coals evenly along the grate. Then I let them burn for a few minutes. Just before positioning in place the two grill grates, I strewed some sodden oak chips on the coals to begin the smoke. Then I put the grates into position into the lowest slot. The amount of coal in relation to the distance of the lowest grate setting seemed right. Plenty of smoke, plenty of heat. I cooked the chops for 2 minutes per side. Only one instance of a flare-up caused me to reposition the chops. As for timing, to cook the eggplant in the oven, after pre-heating the oven to 425, I sliced it into 1/2-inch rounds, slathered them with olive oil, pimentón, and a touch of ground cumin on a foil-lined baking sheet, and tucked them into the oven. Then I reduced the temperature to 375 and let them cook for about 20 minutes. I put the chops on the hibachi too soon. I should have waited until the eggplant had roasted for 5 or more minutes. 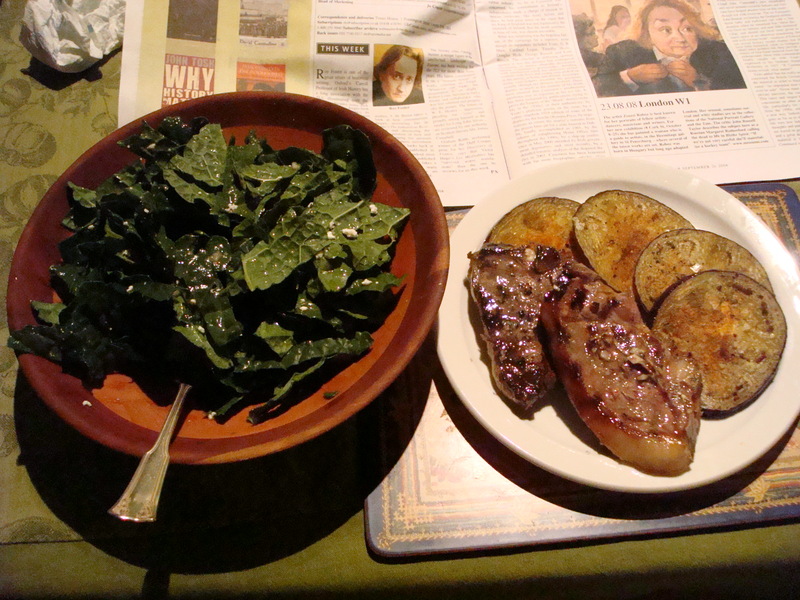 When I removed them from the grill, I put them in a pan under foil until the eggplant was ready. They were medium rare when I sat down to eat, but I would have preferred them just a touch pinker. Timing apart, it was a good meal. It’s a simple, enjoyable meal to make for one or two people. The hibachi made me very optimistic. I have at least another 30 chops to go before this poor lamb has finished its course on this planet. Bring back the Hibachi! Cliché though it may be, timing is everything. It’s clear to me that the hibachi is best suited for quick direct grilling. But I think, with practice, I may be able to do slightly slower grills with chicken and fish. That will require paying attention to the amount of coal. No cover and no way to easily introduce extra coals. 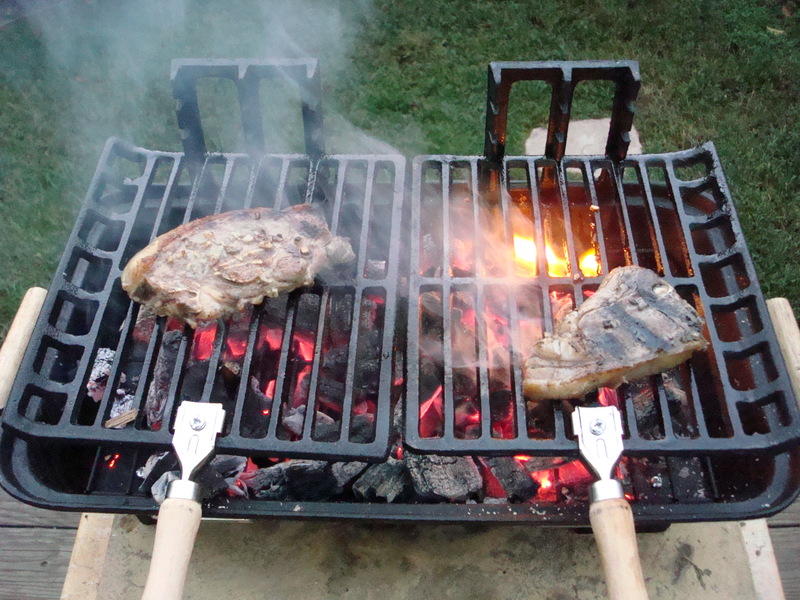 But a higher mound of coal and inserting the grill grates in the second or third slots above may make it easier. 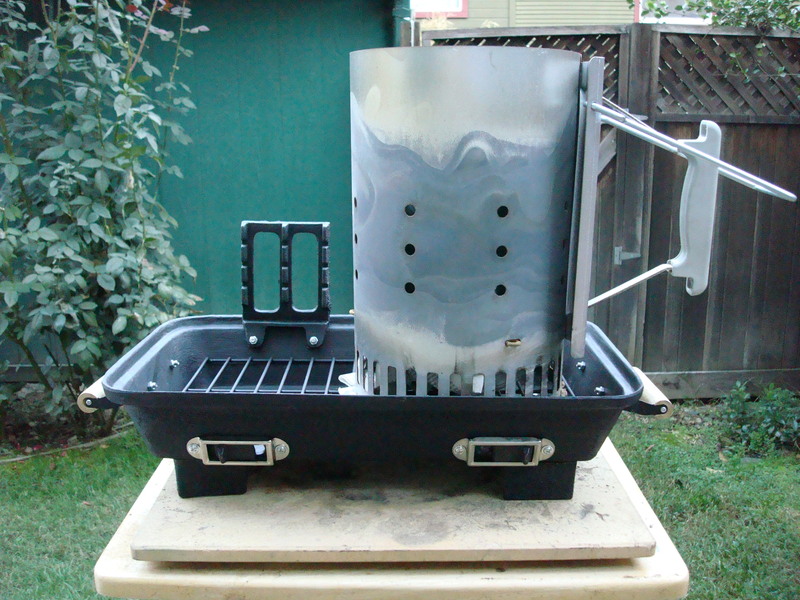 I think there’s a lot of potential here for slower grillings that don’t require covers. For one person, the hibachi is ideal. Disposal of coals the morning after may be a pain, but I am very happy with the first results of this experiment.